Welcome to the Dales Club Site Guide. We ask that both club members and non-members look through the information in this section on a regular basis to keep up-to-date with site issues and changing rules. 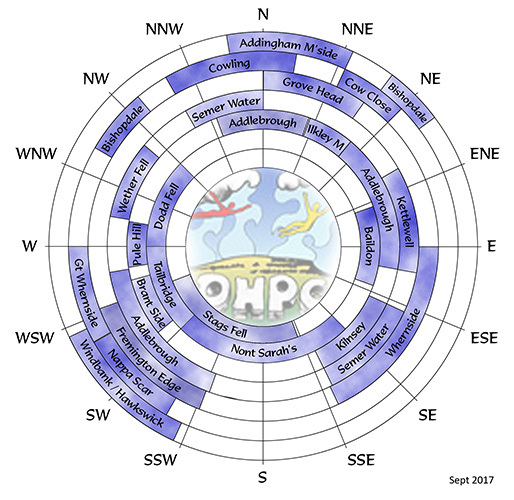 To select an individual site, just click on it's name on the Wind Rose below or in the list on the right. 1. Any pilot flying (or intending to fly) under this arrangement on more than 6 days per year is expected to take out full membership. 2. Visiting pilots must display valid helmet stickers as proof of BHPA/Club membership. 3. Visiting pilots must be fully aware of current site rules and adhere to them at all times. 4. Certain sites, currently Stags Fell, Ilkley Moor and Baildon, are 'full members only' and not open to visiting pilots due to local sensitivities. 5. This agreement is based on mutual trust and is peer regulated. 6. Pilots who knowingly break the trust of the agreement will be identified, named and peer pressure applied to ensure that they join the club. Monitoring this is the responsibility of all members. and may fly their sites under the same arrangements as we apply to visiting pilots. Click here to view all club's site records. The usual caveats apply; don't rely totally on this map or information for your flight planning. You should obtain NOTAMS direct from AIS. The data presented here carries no guarantee whatsoever as to accuracy. If you use this web site's information, and do not back this up with fresh data from AIS, and you fall foul of the authorities, on your own head be it.